Limit[ing] most abortions to the first 20 weeks of a pregnancy. Requir[ing] that doctors performing abortions have admitting privileges at a hospital within 30 miles. Requir[ing] abortion clinics to meet the standards of an ambulatory surgery center. Put[ting] new rules [into place] around abortion-inducing medications, including requiring that women take such medicines in the presence of a doctor. Along with over 180,000 people, I watched in real-time the YouTube streaming of the filibuster, parliamentary procedures, and the eruption of voices in the gallery until 1 am Central time (2 am my time here in Pennsylvania) when the YouTube feed was shut down. NPR has a good report on what happened. Apparently votes are electronically recorded and time stamped into the legislative journal. Reporters took pictures of these records immediately after the vote. The initial record had a time stamp of “June 26, 2013,” which was after the constitutionally mandated shut-down of a special legislative session. Then a few minutes later, the time stamp mysteriously changed from “June 26, 2013” to “June 25, 2013.” Republicans allegedly changed the time stamp for the SB5 abortion bill vote. Behold the magic from Becca Aarronson, reporter at the Texas Tribune that shows this doctored document. 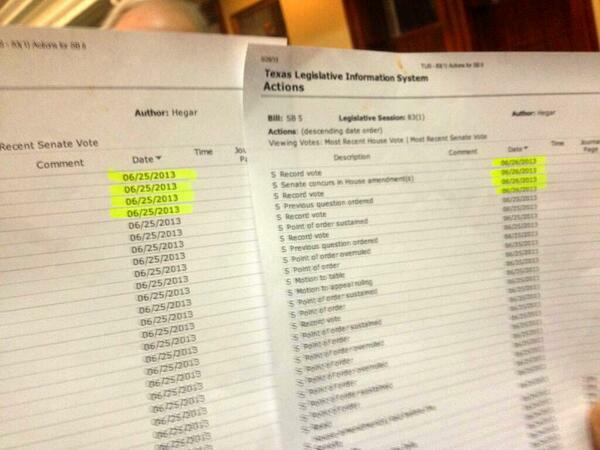 Texas legislative journal on SB 5 before and after someone doctored the time stamp. So why did the Lt. Governor and the radical right-wing concede? Because of the excellent work of reporters in Texas who were able to show that the recorded vote occurred after midnight. There was chaos on the floor and outrage when the Lieutenant Governor said that the bill had passed before the midnight deadline. The Democrats continued to contest the Lt. Governor’s ruling, noting that the voting ended after midnight. Which was documented by the automatic time stamp and noticed by the press. “Regrettably, the constitutional time for the first called session of the 83rd Legislature has expired. Senate Bill 5 cannot be signed in the presence of the Senate at this time. Therefore, it cannot be enrolled. It’s been fun, but seeya soon. Thank you everyone, especially Senators Wendy Davis (D-Fort Worth) for her filibuster and Senator John Whitmire (D-Houston) for his knowledge of parliamentary procedures. They helped create this much-needed victory on the war on women in Texas. Meanwhile, I hope there is an investigation of this attempted tampering of the record in order to circumvent Texas’ Constitution! My home-made meme to express my heartfelt thanks for Senator Davis’ successful filibustering. Thanks, Joanne! I was 100% positive that the voting commenced after midnight! First, I checked my cellphone time (I think cellphones are accurate as to time), and second, the time clock on the Texas Tribune where I was watching the streaming video of the proceedings showed that midnight had passed. When Dewhurst claimed they had voted before midnight I was flabbergasted (and thought, “You liar”!). Thank you to the reporters; otherwise this last irregularity may never have been able to be proven. And, you are correct, the altering done by the Republicans is criminal; whoever did it should be prosecuted. Outrageous and “sleezy” conduct on the part of the R’s! 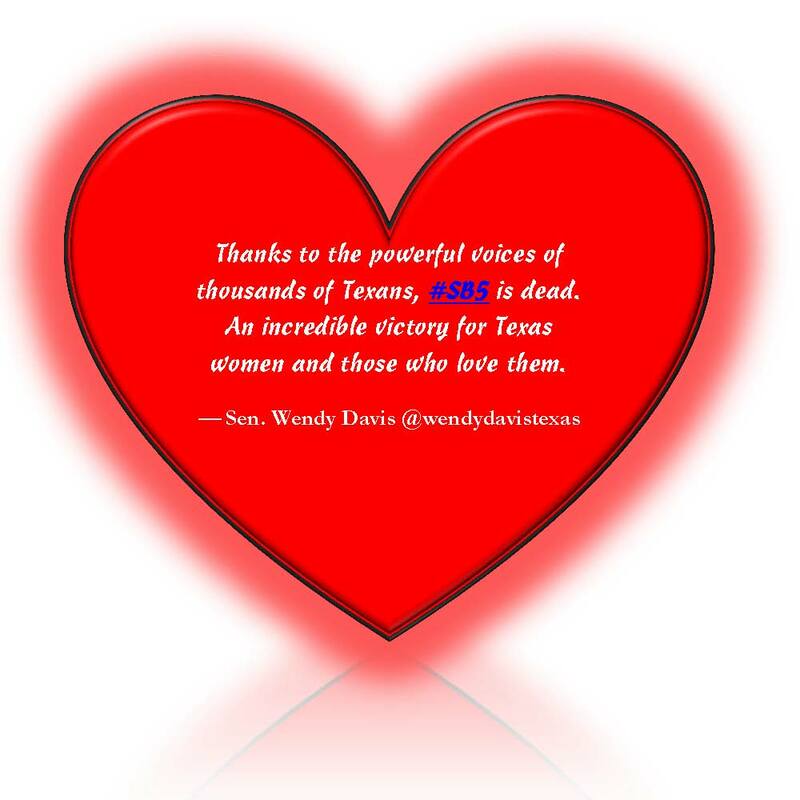 Thanks @WendyDavisTexas, my “badass #feminist #hero.” My “heart-felt” sentiment is w/ you. #reprojustice #filibuster pic.twitter.com/utTPUTU3zU. I’ve already started. And by the way, you don’t have to “like” his Facebook page in order to leave a comment!